The Loyola University New Orleans College of Law and Boys Hope Girls Hope are sponsoring Race Judicata, a family- and pet-friendly 5K race and one-mile fun run/walk, which will be held Saturday, March 9 at Audubon Park in Shelter 10 located at the Magazine Street entrance. 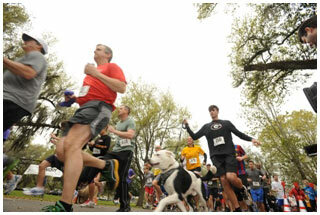 Proceeds from the race provide a safe environment for at-risk children through Boys Hope Girls Hope of New Orleans. New this year, prizes will be awarded for best team name, best-dressed team and individual along with best-dressed pet. Loyola College of Law Dean María Pabón López, J.D., is serving as the honorary chair of Race Judicata 2013 and alumnus Stephen Hanemann, J.D. ’02, is serving as chair. Race registration begins at 8:30 a.m. The one-mile fun run/walk begins at 9:15 a.m., and the 5K race begins at 10 a.m. Complimentary food and beverages will be provided along with live music by The Habitual Line Steppers and a drum circle with Luther Gray of the Ashe Cultural Arts Center. A discounted pre-registration for individuals is available beginning Wednesday, March 6 for the Loyola community and is $17 with a T-shirt or $15 without a T-shirt. Team registration is $75. There will be no race-day registrations for teams. To pay at the College of Law, see Arlene Wiltz in the Broadway Activities Center, 501 Pine St., Room 102 or call her at 504-861-5494. Boys Hope Girls Hope is a nonprofit, privately funded, multi-denominational organization which works to break the cycle of poverty for Louisiana children in need. It provides values-centered, family-like homes and quality education through college for academically motivated at-risk children. Race awards will be presented to first through third overall men and women; first place awarded to men and women’s masters; first and second place awards for teams finishing with best average time; first and second place awards for participation among law firms; and first place men and women youth under 14.